A case study on using a Facebook Messenger chatbot to increase engagement. 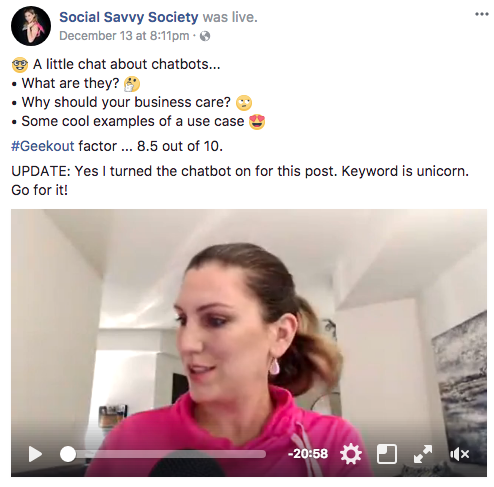 I'm sharing a behind the scenes look at how you can use a Facebook Messenger chatbot to increase Facebook engagement (likes, comments, shares). This case study shows a step by step breakdown of using a chatbot to roll out a contest for a real estate team over the holidays including how it was done, what challenges we encountered, what we learned, and what we would change for the next round. Increase Facebook engagement over the holidays when property inventory is low. Keep in mind that increasing engagement can help your Facebook posts reach more people organically. Organic reach rocks! That means you don't have to spend as much of your marketing budget to reach your target audience. What is guaranteed to get engagement? But Facebook contests can be tricky for engagement when you play by the rules. Asking people to tag people or share on their timeline is a no-no and breaks Facebook's Terms of Service. 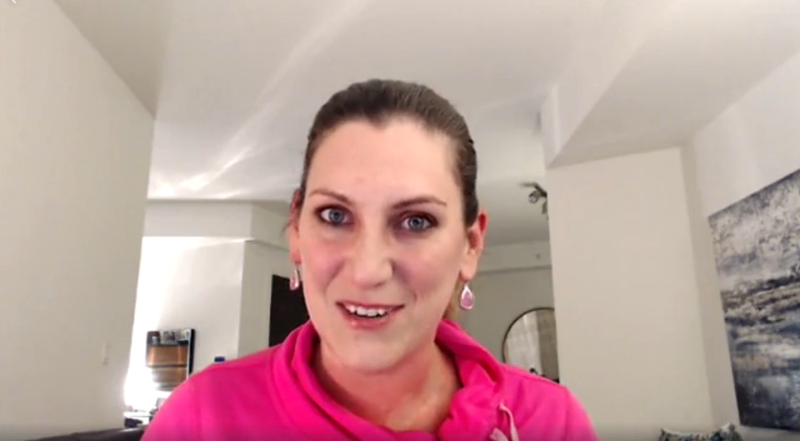 I did a recent Facebook Live on Facebook contests if you're curious to learn more. One of the really awesome features of Facebook Messenger chatbots is that you can have the bot send people a message in Messenger when they comment on your Facebook post using your chosen keyword. The more comments that you have on a post, the better that post will perform organically. See where I'm going with this? The 12 Days of Christmas Contest! 12 Days. 12 Gifts donated by local businesses. We would give away a gift each day for 12 days leading up to Christmas and use the chatbot to help drum up engagement. Sounds like a great idea, right? Little did I know how much work it would be. 😳 Don't worry, I'll share what I've learned and how it could be done so, so much easier. 💡 How I thought I was going to tackle it. Rather than keep it a simple chatbot contest, I decided that we also wanted to collect email addresses and open up the contest to people who may not be Facebook users. Shouldn't be too hard, right? I was wrong. Oh, and because I'm a sucker for punishment, I decided "Wouldn't it be great to add a fun 'easter egg' item in the chatbot winner announcements to keep people engaging?". What was I thinking?? 🙄 Still with me? Ok, so let's see how it turned out! Created using free images from pixabay.com, and assembled in Animoto. 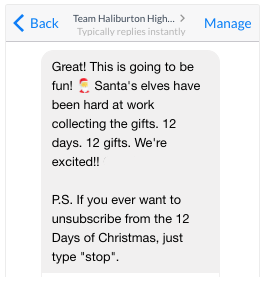 When someone commented "Merry Christmas" on the Facebook post it triggered a ManyChat chatbot message. But wait! A user is not subscribed to the chatbot until they respond or take an action. So we asked the user to reply with 'yes' to be kept in the loop. Voila! Now they're subscribed! In addition, we want to differentiate chatbot subscribers interested in this contest from our overall subscribers who are interested in real estate info. Keep your data clean, people. Keep it clean. To do this, we told the chatbot to 'tag' the user behind the scenes with a tag we created so as the contest progresses, we can send contest messages to people who have opted-in to receive contest info instead of spamming all of our chatbot subscribers who may not be interested. The combination of the teaser video, the build-up of anticipation, and the mystery of people wanting to see what happens when they comment "Merry Christmas" was a perfect recipe for engagement! 🙌 The video performed extremely well organically, and we topped it up with a small amount of paid advertising to keep it alive and well for the full week leading up to contest launch day. We announced the opening of the contest with a Facebook post, a broadcast message to chatbot subscribers, and an email to email subscribers. All included links to the landing page created in Google Forms. Each day we opened up the Google Form, copied all of the current entries, and dumped them into a site called randomresults.com to randomly select a winner. We took a screen shot of the winner result for our records. We also peppered in some Facebook Live broadcast winner announcements to liven things up. Users who clicked the "Congratulate Lynn" button were brought to the permalink for the Facebook post winner announcement where they could engage with the content and leave comments of congratulations. The plan worked! This proved to be very successful at getting people to continue to engage with the content rather than hit a dead end. Over time I realized that the number of people clicking through the just for fun 'easter egg' in the chatbot message was not high enough to warrant the amount of time I was spending trying to creatively come up with more ways to engage subscribers. I tried bad holiday jokes, pics of the realtors as children, a where's Waldo search, a funny 12 days of Christmas video, but in the end it was way more effort and energy than was necessary. Definitely room for improvement there. There were, however, some really amazing things starting to happen when using the chatbot for ongoing post engagement. I began to notice that the chatbot subscribers were a keen bunch and if I made a suggestion, like the example below of asking people to congratulate the winner with as many different winter emojis ⛄️ as they can, people started to have fun with it! By the end of the 12 days, plus the planning, building, and week leading up to the contest launch, I was very happy to see this contest wrap up. In the end, the results blew our expectations out of the water and it was 100% worth the effort. It increased page engagement considerably, and I learned a TON about using chatbots more effectively. One thing I didn't expect to happen is that over 80% of contest entries happened in the first 24hrs of opening the doors to the contest. That meant that the anticipation and build-up was the most important part of the contest. ✋ What would I do differently? Automation. Absolutely incorporating more automation so it does not become such a hands-on chore to administer. I had some great conversations with some chatbot experts through this experience and I learned a few workarounds using Zapier integrations that could make life a lot easier for the next round. Keeping this case study focused on the chatbot, I haven't included many of the gory details of the snags and challenges I ran into with the email side of the contest. The exhaustion factor paved the way for making spelling mistakes and occasional errors. If I were to repeat this contest, I would consider dropping the email component altogether, or building in more lead time for contest preparation including making all of the email templates in advance. Will You Try A Chatbot Contest For Engagement? Well, what do you think? Are you up for the task of trying your own chatbot contest for engagement? I want to hear from you! Let me know how your chatbot experience goes. And just for fun to wrap this up, click the image below for a little video of me gushing about how much I love chatbots, yes, even after this whole experience! I'm extremely passionate about what I do! My digital marketing niche is in Facebook Advertising, Google AdWords and Google Analytics. My true passion is helping small business owners experience the excitement of success in the ever evolving online world of digital marketing!